I wasn’t sure I was going to the Tuesday night protest following the Grand Jury announcement in Ferguson. There wasn’t a local protest. The nearest one was in Santa Barbara, 45 miles away. I hate driving in this winter dark. But I hate injustice more than I hate driving in the dark. Also, I felt like it was the least I could do. Show up. Support. I was inspired by the quote up at the top. Our duty. All of ours. So I went and got there about half an hour late because I had to drive up there after work. 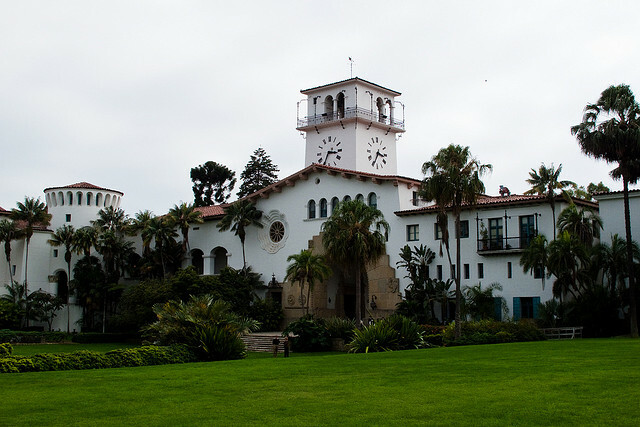 I parked a distance away from the Santa Barbara Courthouse (sometimes called the most beautiful civic building in the world, and I tend to agree – see the photo), thinking there would be a huge crowd. Hoping. Photo by Anna Fox. Used under a Creative Commons 2.0 license. I walked around the front and spotted five people sitting on the wall. I walked up, holding my magic-markered JUSTICE sign still rolled up in my hand. “Um…is this the protest?” I asked. Yes and no. That was what was left of the protest. The others, several hundred of them, had been there and went a-marching. No one knew where. A lady was on her phone, trying to call people who were in the march. She couldn’t hear them well. She said perhaps they had gone to a plaza about 6 blocks away. Just then, three other people arrived, so the four of us decided to go find the marchers. This began a period of us wandering the streets, lost, pointing at clumps of people, saying “Is that them?” It was a beautiful night in Santa Barbara, with twinkly Christmas lights on all the palm tree trunks and a warm breeze blowing, so there were lots of clumps of people out and about. We never found the protesters. I ended up walking back up the street with an LED lighting scientist, him probably regretting his decision to walk with me, because I had 100 questions about LEDs and never wanted to stop talking. He finally said, “Uh, I think I should call it a night…” and scurried away. I went back to the courthouse and by then there were only two other lost guys there, texting friends, trying to find the protest. I called it a night, too. I was going to drive down State Street (it’s a great street! ), but it was blocked. I had seen an ambulance earlier, so assumed there was a traffic-blocking accident. I headed down toward Cabrillo Boulevard, because if you can’t drive down State, you should at least take a trip down Cabrillo, with the palm trees high in the sky over harbor lights twinkling on a perfect sea. But no. The road was blocked again and traffic was being diverted down convoluted alleys and one-way streets. “Santa Barbara cops!” I muttered, frustrated, heading for the freeway. A few miles down the road, I flipped on the radio. “There are hundreds of people blocking State Street and police fear they may head for the freeway,” the news guy said. So don’t worry about me getting arrested at a protest. I can’t even FIND the protest, even when it is right in front of me, blocking traffic. I want to believe that every protest in this case is HUGE, but it’s been little flames here and there. There was a small group outside the Barnes and Noble on the Plaza Friday. I chanted along with them as I passed by and gave scowls to those who mumbled rudeness as they walked by. We’ve started using LED lights to excite fluorescent proteins instead of lasers. Bright and cheap and last a whole lot longer. Exciting fluorescent proteins? You naughty girl! This is a pretty awesome showing up and being present story! Sometimes I do better than others.